Never played the sport or maybe your friend played but you just don't know if you would like it? Come on out to one of our free clinics and see what you think. We provide all the equipment so all you have to do is register to hold your spot and then show up. It's that easy! March 10, 2018 8:30-10am at ASU West in Glendale. *New location*. March 3, 2018 9:00-10:30 at Mesquite High School in Gilbert. February 24th, 2018 8:30-9:45am at Cochise Elementary in Scottsdale. January 6th, 2018 9:00-10:30am at Cochise Elementary in Scottsdale. December 16th, 2017 9:00-10:30 at Mesquite High School in Gilbert. September 9, 2017 8:00-9:30 at Islands Elementray in Gilbert. September 9, 2017 8:00-9:30 at ASU West in West Phoenix. August 26, 2017 8:00-9:30am at Cochise Elementary in Scottsdale. March 4, 2017 9:00-10:30am at Mesquite High School in Gilbert. February 25, 2017 9:00-10:30am at Cochise Elementary in Scottsdale. December 17, 2016 9:00am-10:30am at Mesquite High School in Gilbert. December 3, 2016 9:00-10:30am at Eldorado Park in Scottsdale. Sept 13, 2014 from 8:00-9:30am at Mesquite Elementary in Gilbert. Over 65+ girls attended. Sept 6th, 2014 from 8:00-9:30am at Copper Ridge Field 4. Over 100+ girls attended. March 8th, 2014: 9:00-10:30 at Cochise Elementary. December 14, 2013: 9:00-10:30 at Copper Ridge Field 4. 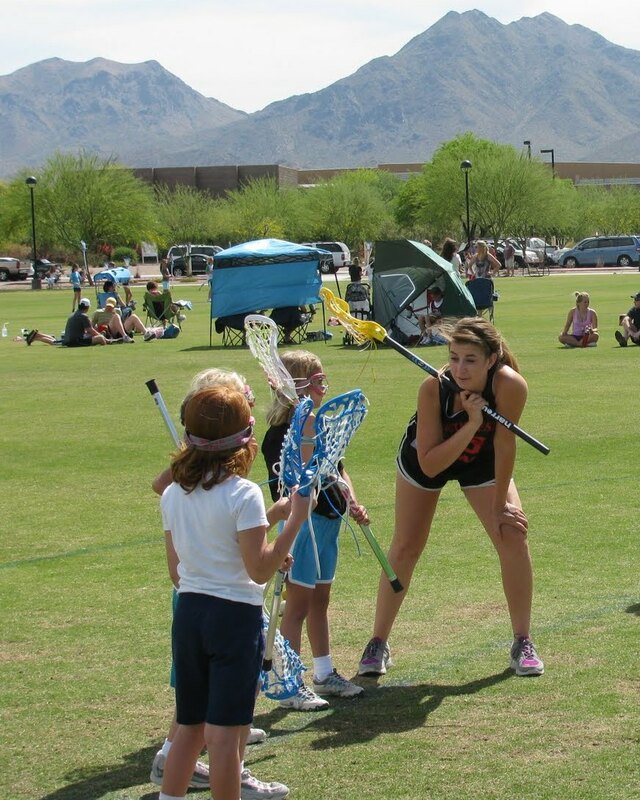 GIRLS CLINIC: Sept 7th, 2013 from 8-10am at Scottsdale Sports Complex Ages K-12th Grade. We had our largest group yet! Over 110 girls! GIRLS CLINIC: March 2, 2013 from 8:30-10:30am at Cochise Elementary Ages K-12 grade. GIRLS CLINIC: December 22, 2012 (originally scheduled for Dec 15th but canceled due to rain) from 8:00-10:00am at Cochise Elementary Ages K-12 grade! We had about 60 girls come out to play! GIRLS CLINIC: September 8, 2012 from 8:00-10:00am at Scottsdale Sports Complex. We had over 100 girls participate in this clinic from ages K-12th grade. 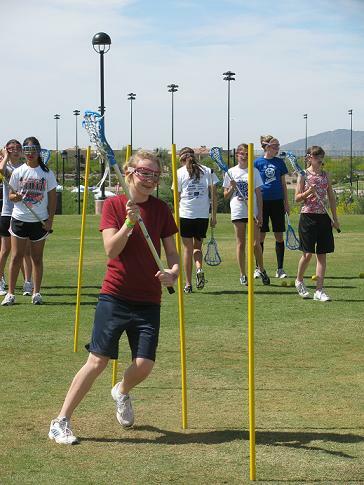 GIRLS CLINIC: March 3, 2012 from 9-10:30am at Scottsdale Sports Complex. December 17th, 2011 from 9:30am-11:30am at Copper Ridge Field 4 in combo with Elite Lacrosse who ran a boys clinic. 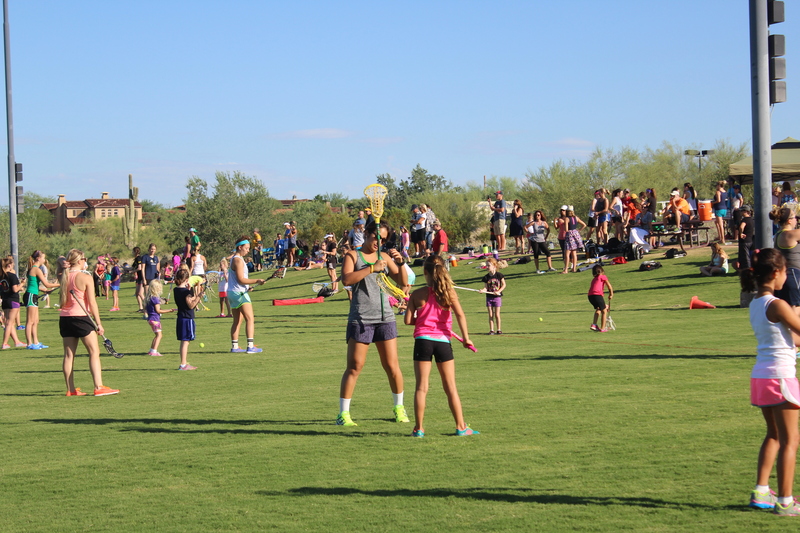 AZGL was at the Sports Explosion Oct 15th running a clinic from 8:30am-9:30am. We got the chance to meet World Cup Soccer Olympic Athlete Brandi Chastain. Also, the Phoenix Mercury's mascot, Scorch, and ASU's Sparky also took some shoots on goal. What a day! September 10th, 2011 from 9:30am-11:30am at Copper Ridge Field 4. We had over 50 kids participate! December 11, 2010 from 10am-12pm at the Scottsdale Sports Complex fields #5 and #6. Combined with Elite Lacrosse to run this clinic for both boys and girls. It was a great success.